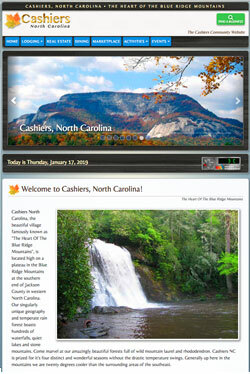 Visit the Cashiers Community Website for information on lodging, great dining, area events and fun activities. Cashiers, a beautiful village in western North Carolina known as "The Heart Of The Blue Ridge Mountains", is located in the southern end of Jackson County. Sitting at 3,484 feet in elevation at the crossroads of Highways 107 and 64, there is a little bit of everything here to enjoy for golfers, families, visitors, and part-time residents alike. Golfing in Cashiers has been described as "a magical experience" by those who visit. There are 16 clubs on the plateau of all types - all wonderful and reflective of our breathtaking mountain beauty. Combine them all and you have over 60 miles of fairways! Life in this mountain community is as multifaceted as its landscape. Cashiers is located on the highest plateau in the Blue Ridge Mountains. The highest peak in the area rises to 5,127 at Yellow Mountain, yet drops to 1,020 feet along the Horsepasture River. This area is spectacularly beautiful, and is unlike any other place in the world. Our elevation coupled with the abundant rainfall combine to create a lush, green rain forest filled with rhododendrons, laurels, mossy rocks, ferns and pine trees. These mountains are some of the oldest in the world and have abundant hiking trails, intriguing legends and gorgeous scenery. Cashiers North Carolina's singularly unique geography boasts hundreds of waterfalls, quiet lakes, stone mountains and amazingly beautiful forests. Because of it's unique geography and altitude the climate on the Cashiers plateau is generally about 20 degrees cooler during the summer months than just about anywhere else in the southeastern US! Weather is generally cooler up here, regardless of the season. Temperatures average a high of 80 degrees in July, and 40 degrees in January. Regularly, Cashiers receives over 100 inches of rain per year which makes this a very green and lush place, indeed! Come experience the magic for yourself in Cashiers, North Carolina, The Heart Of The Blue Ridge Mountains. View information about each club in the area. Covering the communities of Cashiers, Highlands, Sapphire and Toxaway. Course descriptions with yardage and par, and golf pro information. Additional activities are listed if available. Contact the club via email or go to their website. Watch this video and see a helicopter fly-over of Cashiers, Highlands and the surrounding mountains. Lake Glenville, Lake Toxaway, Whiteside Mountain, Whitewater Falls and much more are here. Fly over Wade Hampton Golf Club, High Hampton Inn and Resort, Country Club of Sapphire Valley and Trillium Golf communities. Give us feedback! Let us know how we're doing! We welcome your feedback and continuously strive to improve this website to make your experience better. Send us your comments and suggestions! Your Resource for Golf in Cashiers! CashiersGolfing.com, the brainchild of local artist and web developer Steve Johannessen, was launched in 2014. This site was created to give area visitors an overview of golfing and golf communities on the Cashiers-Highlands plateau. This online magazine is provided as a free community service to promote golfing in the Cashiers area. The clubs listed on this site provide no compensation for appearing here and are listed free of charge. Listed clubs are not responsible for the content on this site. For up-to-date information on each club please visit their respective websites.